Both men and women wear ornaments – in fact, at celebrations, it is the men who are more gaily bedecked! Most of the ornaments are made of beads (made from bones, seeds, wood) worn as laces, ropes, fillets and collars. Earlier, iron, brass and copper wires were into armlets; today, silver and gold are used. 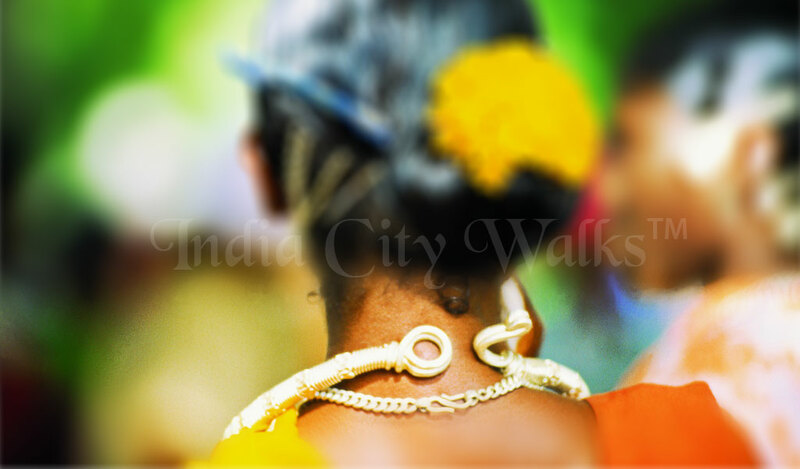 Gold is worn mainly on the ear, nose and neck (men wear gold collars to indicate their standing in the village), not on the hands and legs. Silver is worn on the neck (as a hoop); on the wrist (as a loose, hollow, twisted tubular bracelet); on the legs (as a solid, square-bar anklet, arched below the ankle-bones). Conical twin-tops are common in the nostrils and ear lobes. Rings are worn on the helix of the ear. Precious stones are not very popular, but when used, red and green stones are preferred, mainly because of their bright colours. Tassels of red wool are still worn by both men and women of the Hill-Maria tribe. You can buy tribal ornaments and combs from any of the major haat bazars as well as in the jewelry showrooms in the towns of Jagdalpur, Kanker and Kondagaon.